Every year we see a fresh Fortune 500 list, filled with company names we all know and love. These companies are running the world as we know it today, whether they are ecommerce websites, technology companies, life science firms, entertainment giants, or car manufacturers, these companies all represent success. Many of these companies, however, are also in highly competitive industries. Take the technology industry - multiple companies are producing similar software solutions, hardware, or consulting services. 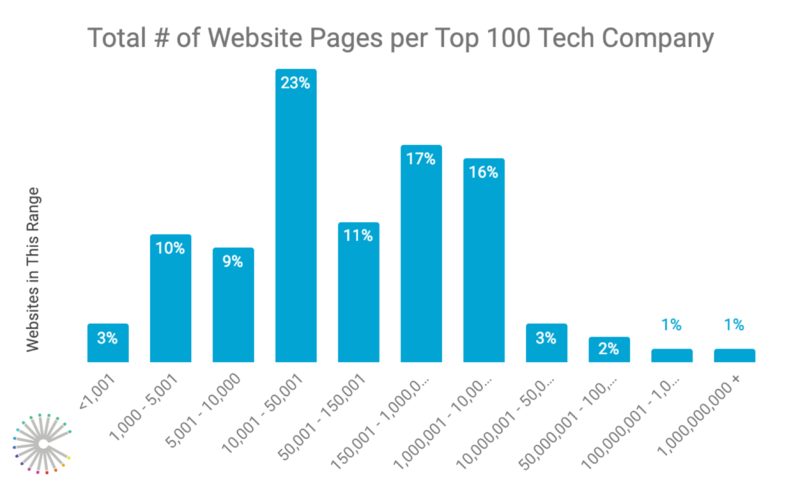 This year, we decided to dive in and analyze the websites of the top 100 technology companies on the list, and see what their websites have in common, and where they differ. Let’s take a look at what we found. Most of these companies have a robust online presence, so it was no surprise that the majority of websites have more than 10,000 website pages. In fact, 74% of these websites had more than 10,000 pages on their site. The extreme outliers are Roper Technologies with only 643 website pages, and at the opposite end, unsurprisingly, Facebook took the title of the most website pages with 1,100,000,000. Interestingly enough, the companies with the most website pages were B2C companies. This is likely due to the fact that those companies are either selling physical products to customers, offering software services, or are social networking sites. A company homepage is, more often than not, a customer’s first impression. The type of visuals, messaging, and imagery that companies use should have the main goal of engaging and retaining site visitors. So, what types of visuals do tech companies feature? First, we analyzed the use of stock photos, which we counted as any images that looked professionally produced, but that weren’t unique to that company. This included photos of people working in an office, a business meeting, a city scene, or a generic piece of technology. A whopping 76% of companies feature these images on their homepages. When it came to images of people, we considered both stock photos as well as people who are being featured from the company, a customer, or an event - any image that gave the homepage a more interpersonal feel. We found that most companies feature images of people on their homepage, 72% to be exact. Interestingly enough, when we analyzed if these companies were using images of physical things versus graphics and illustrations, we found that only 8% of these companies use illustrated graphics on their homepage. Finally, we analyzed if these companies were featuring their own product images on their homepage, which for many of these companies, should be the first thing they feature. What we found is that only 59% of these companies feature their product on their homepage. Digging a little deeper, we found that only 54% of B2B companies on this list showcase product images, and nearly 76% of all B2C companies feature their product. We also wanted to know how many of these companies were hosting product videos on their homepage. As for the general use of videos on the homepage, it was shocking to discover only 30% of these technology companies had any video on the homepage. Even more shocking is that only 16% of these companies have a product video on their homepage. What are these companies trying to gain from website visitors? Your first thought is that they’re trying to gain more customers. While that may be the end goal, their main CTAs don’t outright reflect that. 40% had the main call to action as Read More or Learn More, linking the visitor to product information or articles. 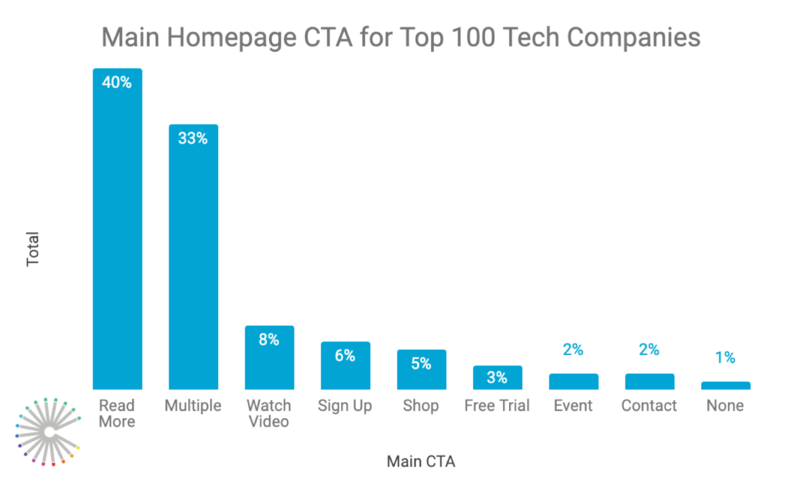 The second most popular type of call to action was not one, but actually having multiple CTAs, at 33% of the top 100 websites. These were in the forms of A/B tests, sliders, or multiple CTAs side by side at the top of the homepage. When a company had multiple offerings or multiple articles they wanted to highlight, they took full advantage of showcasing all of them. There were six more types of CTA we identified and one website without any CTA. While all of these websites share an industry, they all direct consumers to their unique offerings. Being able to contact a company is important, right? Maybe you’re an existing customer, or maybe you want to become a customer and have some questions. No matter what your current status is, you want to be able to contact a company through their website, either by phone or directly on their site. What we found is that only 5% of these companies have a chat feature on their homepage, and only 26% have a phone number on their homepage. While there may be other ways to contact the company on the site, potentially through forms, there is a lack of direct contact for consumers with these companies. Commonly among technology companies, especially B2B companies, pricing will not be made public on the website, usually to keep their pricing information secret from their competitors. Overall, only 44% of these companies share their pricing on their website. Out of those companies, only 35% of the B2B companies on this list had their prices listed, whereas 69% of B2C companies had their prices publicly facing. The B2C companies that didn’t have their prices listed were social media sites, which are free for users, and a parent company of a B2C site, which had their pricing on a third-party website. While it’s a personal preference of the company to have or not have pricing on their site, customers definitely appreciate when they can find the information they’re searching for on a website. Blogging is a great way to build brand awareness, share your subject matter expertise, and share your thought leadership with the general public. Blogs seem to be extremely popular amongst these top 100 technology companies. 79% of these companies are blogging and sharing their articles on their website. While they may not be listing their blog on the homepage, they do have a library of blog articles on their website, giving visitors and customers the information they need to expand their knowledge. In today’s world, nearly all companies have a social media presence. This was accurately reflected by these companies. Social media is a great way to build brand awareness as well as connect with potential and current customers. Instagram isn’t the strongest platform for some of these technology companies to get in front of their ideal audience, especially for some of the B2B companies. The most popular platform is LinkedIn at 98% of these businesses having a corporate page, followed by Facebook at 96%, and Twitter at 94%. The one social platform with a lower turnout is Instagram, with only 82% of these companies having a profile. Surprisingly, Instagram had one of the widest range of followers. The lowest recorded for this data set was 14 followers and the highest recorded was 12,600,000. Facebook also had a wide range of followers, ranging from 32 to 213,469,188. For LinkedIn, the most popular platform for these companies, the follower count ranged from 2,504 to 6,627,748. Finally, Twitter ranged from 266 to 55,900,000. It’s also important to note that not every single company on this list has a profile on each of these platforms, so some companies have a large following on one platform, and no presence at all on others. A company website is one of the most valuable tools we have for getting to know a company. While no two websites are the same, we can clearly note the common trends whether it be images, website pages, or resources. On a company website, we can see who works there, what they do, how much a product costs, and how companies interact with their customers. These top 100 technology companies from the Fortune 500 list are leading the way in the industry and setting the standard for enterprise technology websites.